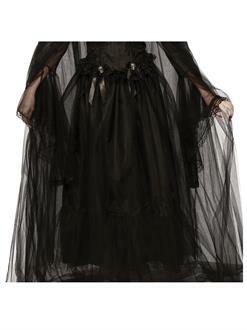 Do you need a gothic skirt for Halloween? Our Women’s Soulless Skirt is great for any dark and spooky Halloween costume. It’s made of 100% polyester and has intricate bows with skulls along the waist making it ideal for any gothic women’s Halloween outfit. You can transform yourself into a vampiress, gothic goddess, witch, evil priestess, and so much more! Shop a Women’s Soulless Skirt today!